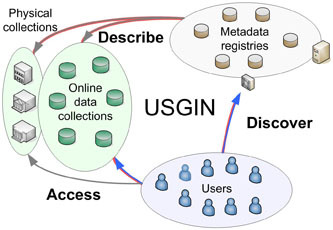 A partnership of the Association of American State Geologists (AASG - state geological surveys) and the U.S. Geological Survey (USGS) formally agreed in 2007 to develop a national geoscience information framework that is distributed, interoperable, uses open source standards and common protocols, respects and acknowledges data ownership, fosters communities of practice to grow, and develops new web services and clients. The AASG and USGS have formed an interagency Steering Committee to pursue design and implementation of the U.S. Geoscience Information Network (USGIN). The U.S. Department of Energy under award DE-EE0001120 to Boise State University and under award DE-EE1002850 to the Arizona Geological Survey acting on behalf of the Association of American State Geologists. The nabble page has been removed.